Guacamole is one of those things that took me awhile to warm up to. I have made this recipe a couple of times and my family has loved it. And now after those few times, I can say I am fully on board with loving this avocado-based spread. 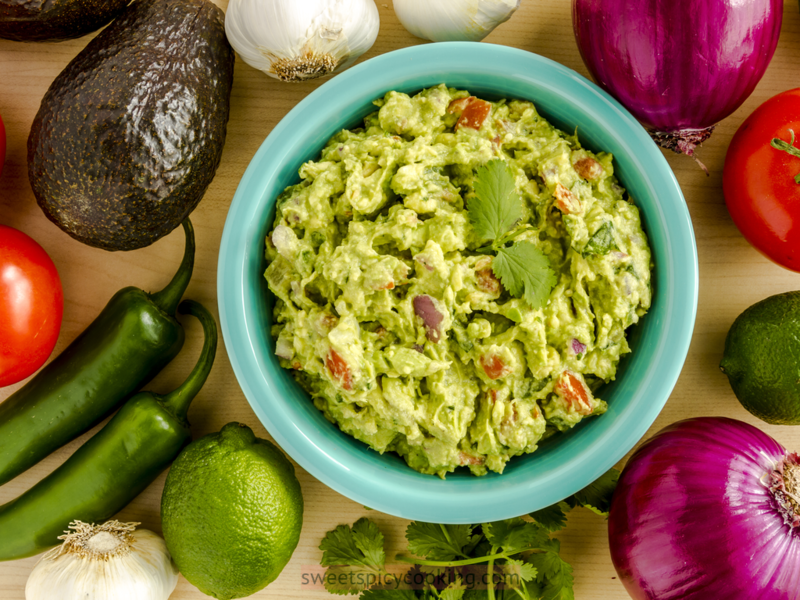 This guacamole is not short on flavor and is full of simple fresh ingredients. When making guacamole, make sure you use ripe avocados. You can tell an avocado is ready when it has a slight give to it and doesn’t feel very firm. Large Hass avocados are my favorite to use. Also, use fresh garlic instead of the powdered stuff and freshly squeezed lime juice. Make sure to season it well with salt and pepper. Avocados are pretty bland on their own so you need to season well. Before we start, check out this delicious Zinger Burger recipe from my last post! Prepping the avocados: First, cut the avocado in half. Then remove the seed and then scoop out the flesh using a spoon. Do this by going around the edges where the flesh of the avocado and skin meet. Then scoop out. Place the avocados in a bowl and mash them using a fork. TIP: Don’t completely puree the avocados because a slightly chunky guacamole is the best. Prepping the guacamole: Add the lime juice on top of the avocados to prevent them from browning. Then add the remaining ingredients and mix them in. Make sure the salt is enough because you don’t want your guacamole to taste bland. Serve the guacamole with some tortilla chips and sliced veggies. Storage: Guacamole should be enjoyed right away. But you can store the guacamole in the refrigerator for a day, but it might brown. To prevent that from happening, squeeze some lime juice on top and then place plastic wrap on top of the spread. Servings: 4-6. You can always double the recipe if you want to make more.